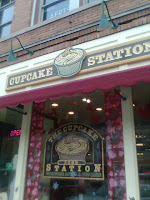 A few days ago I treated myself to a stop at the Cupcake Station which is located in downtown Birmingham. It's a good thing I don't live closer to this place or I would fall into this temptation more often! 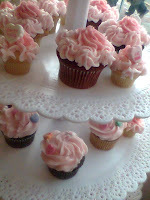 Don't these Valentine cupcakes look yummy? They didn't have my favorite cupcake (Almond Joy - it must have been a monthly special) so I opted for the Michigan Bumpy Cake cupcake. 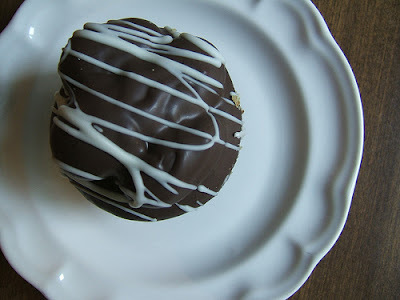 (If you don't live in Michigan, you may have never had a Sanders Bumpy Cake - chocolate cake with ribs of white frosting covered in chocolate glaze.) 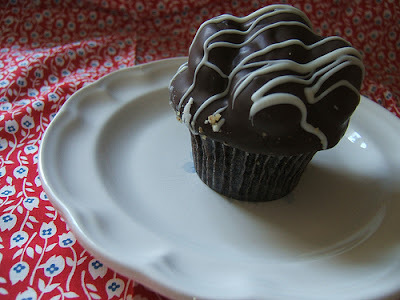 Below is the cupcake - there were yummy bumps of white frosting under the chocolate. Enjoy - virtual cupcakes have no calories! wow karen - those look and sound delicious and sweet! fun blog - i didn't know you were such an avid quilter! Hey Melissa, thanks for checking out the blog. I'm not that avid a quilter, but I do enjoy doing projects every so often. The quilts I posted cover things I have done over maybe 8 years or so. And some of these projects take me forever! i just wanted to say thank you for the pics! i'im going to show them to my baker... i'm playing a double wedding right now and we are going to have cupcakes!